" By TUMMEL AND LOCH RANNOCH AND LOCHABER I will go . 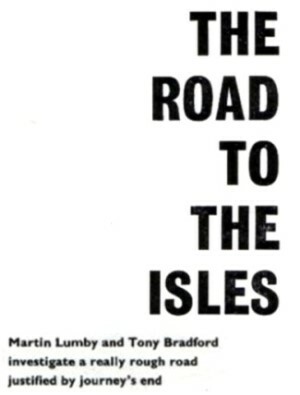 . ." This rousing litany of the Road to the Isles grips the most blasé southerners. 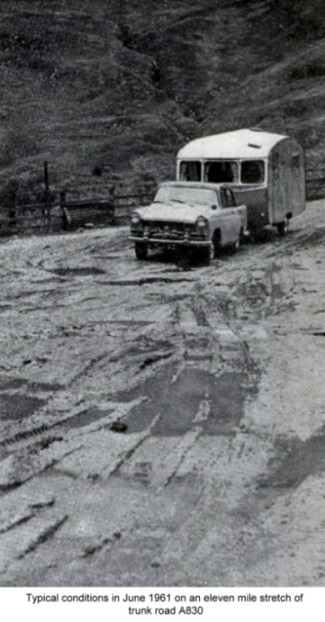 But the Caravan Club Handbook, until this year, warned caravanners to avoid A830, its modern name, because of an eleven-mile stretch of heavy road works. The warning was justified but we took A830, because the advice was a challenge in itself (there was bound to be something worthwhile at the other end) and because it was included in quite a matter-of-fact way in an outline itinerary. The route was requested from Robin Traill , sales manager of Thomson's whose Glenalmond we were road-testing last summer. We asked him to nominate 1in. O.S. maps and sketch out a route which would show us as much as possible of the best Scottish scenery in the shortest time from the Falkirk works. We know Traill, he knows us: rough going is a must if the view is to be enjoyed. Robin Traill's route took us to Glen Coe, Ben Nevis, Rest and Be Thankful, the Trossachs, the Road to the Isles, innumerable lochs including Lomond and Katrine. No high speed American tourist, bent on 'doing' ~the western Highlands in three days, could ask for more. But for us the high spot was the Road to the Isles. Despite l20in. of rain there last year and peat under the road to a much greater depth than expected, the road works should be fully, or at least nearly, completed by this summer. We picked up A830 just outside Fort William, leaving Ben Nevis towering behind us. The first fifteen miles, mostly alongside Loch El are quiet enough, almost dull. But Prince Charles's Monument (Scotland sheet 35, 906805) where Glen Finnan runs into Loch Shiel, was the herald of tough times ahead. 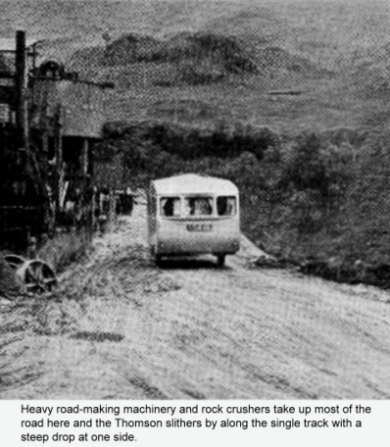 Within a mile or so, after Glenfinnan, the road at times did not exist-just a spread of muddy potholes and rocks, or else Hobson's choice between high rocks leading to the mountains either side. This went on for eleven miles, the scenery mean­while leading to Loch Eilt. Just to fool you, a stretch-anything from 300 yards to a mile and a bit-of excellent new road would greet you. The first time, we tore off, only to plunge with brakes hard on into a mess of slush with rocks below the water. Sometimes we were at a loss to know which course to plot in order to reach the right exit for whatever track lay over the crest. At one point we saw a tiny church, beside the road in splendid isolation, and wondered where the minister and worshippers came from. As the magnificently unmade surface widened out, one answer appeared with a cheery wave. The minister stormed past in fine style in a Triumph Herald. 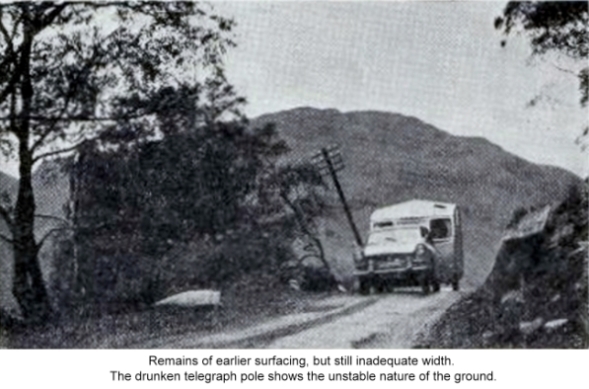 At Lochailort we regained normal road surface. From here on it is mainly narrow, very wiggly, but well worthwhile. 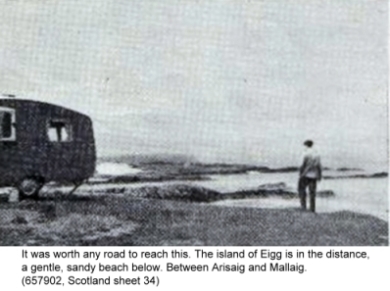 At first through friendly woods, the road brings you to Arisaig, where there are numerous sites near the sea. At 659877 (Scotland sheet34) we saw a van with two drawbars which Robin Traill had told us to watch out for. The next five miles are the gem of the journey, breathtaking coastline with many inlets creeping up to the road. After Morar you come to the end of the road, at Mallaig harbour, with Skye only four or five miles away. We filled up with water on the jetty, turned back and found a little site near Morar golf course. When we wound down the legs, stretched, and gazed out to the view of Rhum, Eigg and Muck, south of Skye, it was well past eleven at night. The icy water lapping the beach chilled the wine for our late, late dinner. In these midnight sun conditions, it's nothing to tow 180 miles between lunch and dinner and never feel tired. 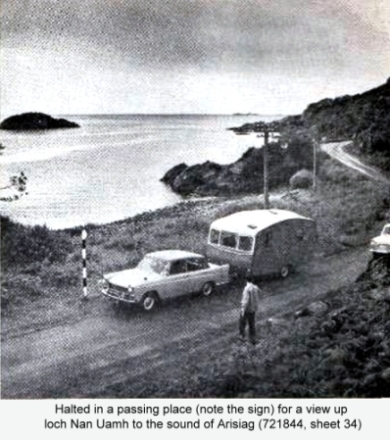 On the Mallaig coast we saw several trailer caravans sited but only motor caravans mobile apart from ourselves. With the roadworks finished soon, give yourself a treat and take the Road to the Isles. If you take the Road, you'll want to see the rest of the ground we covered. Other experts may differ but we felt that Robin Traill's suggestions had been well worthwhile. From Stirling, the A84 takes you to join the A83 at Loch Earn, later joining the A82 north of Loch Lomond, with impressive mountains all around, the climax being Glen Coe. From here you have the choice of turning right to encircle Loch Leven, or taking the Ballachulish Ferry as a short cut; the trip round is a pleasant run. Even more pleasant in the afternoon sun was the run up the head of Loch Linnhe to Fort William. Coming back from the road to Mallaig, we used the Ballachulish Ferry and headed south on A828. To link up with the A82 to Oban, you have to take the Connell Ferry bridge (why Ferry is a mystery-it's a full-blooded bridge, shared with the railway, and costs an average outfit about 10s. to get across). After Oban, typical seaside tripper town, the road south to Lochgilphead is pleasant but not thrilling, whereas the turn north on A83 to Inveraray is more attractive; next high spot is Rest and Be Thankful, very impressive in bad weather,before Arrochar, where the Caravan Club and the Forestry Commission run good sites. Loch Lomond comes next but we found it over­rated, with hordes of mimsers dawdling along the bankside roads. Much better was a detour we made from Aberfoyle, after turning north east from the foot of Loch Lomond. 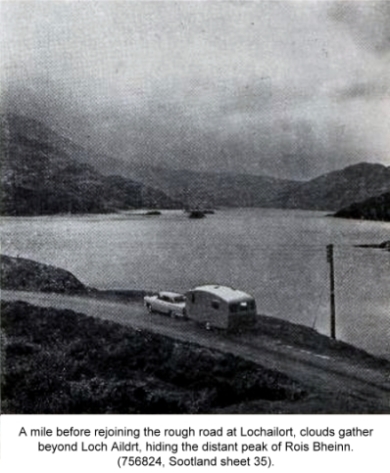 From Aberfoyle, a dead-end road, B829, leads past Loch Ard and ends between Loch Arklet and Loch Katrine, where Glasgow's water supply comes from. The road up there is narrow but delightful. Back to Aberfoyle, then the Trossachs (kid's stuff, said Traill) which are seen best before or after the daily coach trips get there. From here, you are but a few miles from Stirling, the start point. For those of you whose appetite has been whetted to the extent of looking up maps, don't waste time looking for an expanse of water named Lochaber. Tummel and Rannoch are lochs, but Lochaber is a district.